Technology, bitter foe. I came home excited to make this recipe I saw in the Times, along with a fascinating article on Hungarian Hannukah cooking. Nevermind that I had really only read the article, and barely glanced at the recipe. 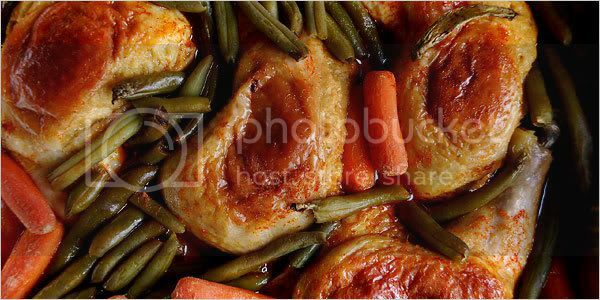 I could remember well enough what kind of supplies I would need at the store–chicken quarters, Hungarian paprika, mushrooms, green beans, and carrots. But once everything was home, of course it was time to really follow a recipe. I’m not Hungarian and wasn’t about to wing this. Yet. I’ve never been big on signing up for internet connection. As long as you can steal some from your neighbors. This had been the case for the past few weeks in my new apartment, the fluctuating, shaky signals that I’ve been receiving and doing my work with in one particular corner of the living room. But I wasn’t picking up anything. And after taking my laptop with me on a tour around the apartment, sitting on the floors of every corner of it, deciding not to bother a friend with looking up the recipe on their computer, it was after 8pm and I was starving, so I conceded to wing the recipe. I know a little about bread stuffing, and had remembered seeing the recipe call for challah bread pieces to be used in theirs. I didn’t have challah, but I did have some pita lying around, and tore those into pieces in a bowl. Next I sliced up mushrooms and onions and sauteed them quickly in some butter. I beat an egg and added the bread and mushroom mixture to it. Not knowing it, I was following the recipe pretty accurately for this part and this part only. 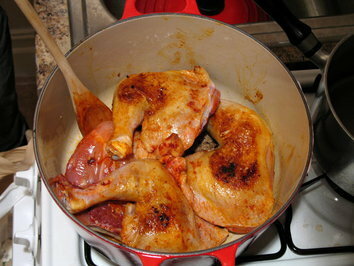 I didn’t remember how the paprika was to be used in the recipe, so I smeared some onto the chicken quarters (and stained my hands in doing so) along with some salt. I turned up the heat and lightly browned the chicken quarters on their skin, then remembered the whole part about stuffing under the skin. Luckily, the skin was resilient enough after it cooled that I could still poke underneath it and fill pockets of stuffing. After arranging the chicken above a bed of some green beans, carrots, and a bit of leftover stuffing, I was ready to put my dutch oven in the oven. Only when I opened the door to the new stove I had never used before, I realized that the whole time I had thought I was preheating it to 375 degrees, it wasn’t. By then it was 9pm and still starving. Long story short, I never did figure out how to use the oven. The pilot light hasn’t been ignited and I couldn’t find a hole somewhere in the side to hold a flame up to, or a metal coil, or any other way to trigger a possible electronic pilot in it. Ben and I called our mothers and our friends, to no avail. Giving in to failure, it was time to cook the dish the only way it could be, on the stove range. I found a can of chicken broth and poured it into the dutch oven so that it wouldn’t burn, and set it to a medium simmer. About an hour later I wasn’t happy with the done-ness of the chicken and, conceding to utter, complete and foolish failure, scrambled up some eggs and made toast and served that for dinner at 11:00, while the big red pot bubbled away in vain. Before retiring the dish to the refrigerator for the night, I took a peek inside. Instead of turning golden brown along its ridge of skin, the chicken pieces looked slightly bruised and bluish from the mushroom stuffing that you could see through underneath. The stuffing stayed in its place surprisingly well, despite the fact that the skins were peeling off the chicken legs and meat was coming off the bone by the time I stopped cooking. But it did smell wonderful. So wonderful, in fact, that I packed up a tupperware of it and brought it with me to work the next day. There was nothing that could be done for that poor dish’s appearance to save its life, and the microwaved-in-tupperware ordeal did nothing to help. The bones jut out oddly and distinctly from the loosened meat, the stuffing stuck together like a firm pat of hamburger. The skin was just elastic, thick and unbecoming. But I took one taste. And it was delicious. 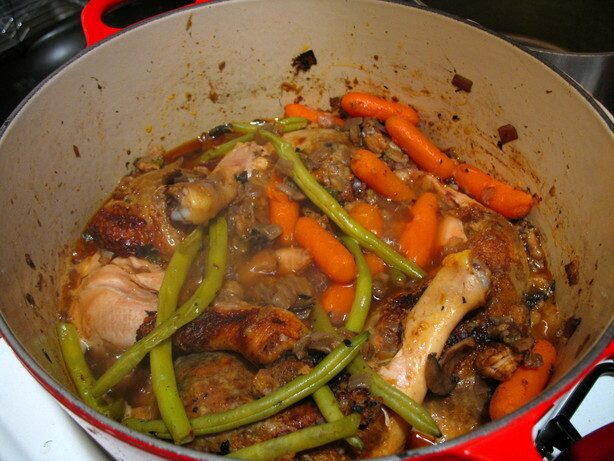 The carrots were tender and plumped with juices, the green beans soggy but not in an unpleasant way. Homey and universal, it was one of the best recipes I had ever followed, even though I didn’t really follow it. This is God’s punishment for non-Jews who try to prepare authentic Hannukah cuisine! You should stick to zuchinni parmesan latkes, goy. I’m glad it was delicious, but I expect beauty from you as well. i learned the hard way in an old apartment that sometimes you have to open up the broiler on old oven and stick your hand in and light the oven from below. however, if you didn’t hear a big boom when you turned on the stove after “preheating” for a long time, that may not be the problem afterall. Info about cars More than 250 Models. Go and read this car site! This site was extremely usefull to me, thank you for that. This site provided me lots of good and usefull info. I also got a site about laptop-information, maybe you can drop by some day so we could share some info. Well, I hope to hear from you soon and ones again, thank you for this great blog! Its amazing to me how many ways one can go about investing your money. I’ve found for me that best solution is both risky and low risk stocks. I normally put about half of my investments into low risk mutual funds that grow over time plus the other half in high risk high gain stocks. I recently got into day trading and I found that software stock picks are the most reliable as they can automate a process that I cant do quickly enough. The guys over at stockmarketsoftwareblog.com have a terrific system. You might want to check them out! I bookmarked this web page a while ago because of the informative content and I have never been let down. Continue the outstanding work. Hey, I was reading your post and I just wanted to thank you for putting out such excellent content. There is so much crap on the internet these days its difficult to find anything worthwhile. I actually have cooked this recipe before, I got this book last month on recommendation from a friend http://ninjahq.com/go/cookingrecipes and it turned out quite nice! I’m extremely eager to try your variation of it though, it looks excellent. I think you might enjoy those recipes, they’re very good. Thanks for the article and great ideas.